How well do you know McGill? Our year-end Trivia Quiz in The McGill Reporter this year is all about the University, focusing mainly on its rich and remarkable history. Twenty-five questions to test your knowledge about the place where we study, teach, work and, once in a while, play. Our year-end Trivia Quiz in The McGill Reporter this year is all about the University, focusing mainly on its rich and remarkable history. Twenty-five questions to test your knowledge about the place where we study, teach, work and, once in a while, play. Take the trivia challenge and see just how well you know your stuff. 1. What is McGill’s formal name? 2. Noted Trivia Quizmaster and sometime professor of chemistry David Harpp has another role at McGill. What is it? 3. What was in the McCord Museum building before it became a museum? 4. One of the following is not a McGill alum. Which one? 5. What name did some McGill women’s sports teams go by in the 1950s that would be unthinkable today? 6. Name three examples of brutalist architecture on the lower downtown campus. 7. What did McGill’s Board of Governors forced Stephen Leacock to do – against his will? 8. How many McGillians now sit in the House of Commons? 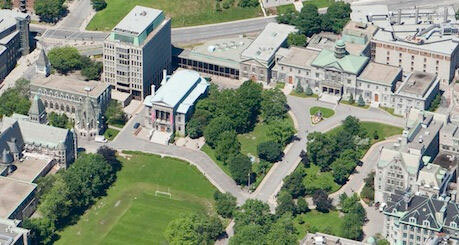 9. Who among the following has NOT been Chancellor of McGill? 10. What product was sold to raise funds to help build the Currie Gym? 11. When it opened in 1862, it was called Molson Hall. What is it more commonly known as today? 12. Which is older – the Royal Victoria Hospital or Royal Victoria College? 13. After whom is the McLennan Library named? 14. What member of the aristocracy laid the cornerstone for the Frank Dawson Adams Building in 1950? 15. It used to be called the New Music Building. What’s its new name? 16. Within two years, when was the portico built at the front of the Arts Building? 17. Including Suzanne Fortier, how many Principals have there been at McGill? 18. Leacock 232 is formally known as the Robert Vogel Conference Room. Who was Vogel? 19. Who among the following does NOT have an honorary degree from McGill? 20. Who was the first McGillian to become Prime Minister of Canada? 21. Well-known Montreal architect Dan Hanganu designed what building on the upper downtown campus that was completed in1998? 22. Which of the older buildings on the lower downtown campus has a sculpture of a phoenix rising from the ashes? 23. What is the Goodwill Fountain more commonly known as? 24. Who among the following has NOT been Chair of McGill’s Board of Governors? 25. What was notable about Carrie Derick? Within two years, when did William Shatner graduate?